Thornton says he is excited to be offered the position. 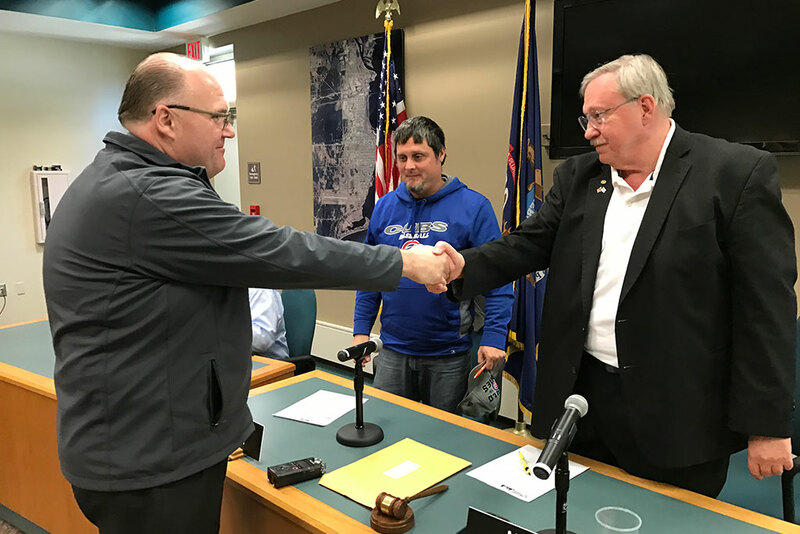 “I’m thankful that the Escanaba City Council afforded me the opportunity to become a part of the Escanaba team and help continue the path and projects and seeking out the opportunities that the city has been trying to do and continue that with the retirement of Mr. O’Toole,” said Thornton after the council vote to offer him the job. The choice came down to Thornton and Darcy Long of Amery, Wisconsin. Councilman Mike Sattem said Thornton stood out from the other candidates during public interviews with the council Tuesday night. “I think Jeff showed a lot more initiative. He learned a lot about our city. He came in (to the interview) knowing quite a bit more. I just think Jeff showed more initiative foe the city of Escanaba,” Sattem said. Thornton was terminated in February as Negaunee’s city manager. The Negaunee City Council said they had a difference on how to proceed on economic development in the downtown. The Escanaba City Council last night also interviewed William Yost of L’Anse. The council will now conduct background and reference checks and begin contract negotiations. Councilman Ron Beauchamp and Mayor Marc Tall will serve on the negotiation committee. Share the post "Escanaba City Council chooses Thornton to head city"